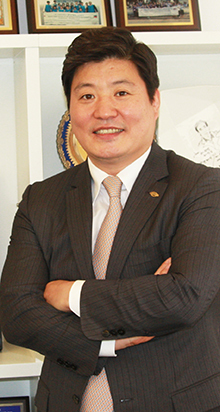 Sportsman-turned social worker Heo Joon-Young is perhaps one of the busiest persons in the whole world. Every week Heo hosts or attends an average of 15 or more social or medical service pro-bono works directed to helping the needy folks or other socially vulnerable people both at home and overseas. "Sportsdoctors,” founded by Heo years ago, boasts of over 200,000 medical doctors as its members in South Korea alone. Recently Heo's Sportsdoctors signed an agreement with the Association of Private Doctors boasting of 40,000 doctors as its members. With them Heo will embark on the overseas medical services for needy children in the poor countries. "I will visit the needy folks suffering diseases and poverty in every corner of the global village," Heo said in a recent interview with the local media. "I will make Sportsdoctors the fastest NGO visiting the suffering folks"
The UN-registered medical service social NGO is expected to become the largest and most important NGO of its kind in the near future, Heo hopes. Before he turned himself into a social worker and philanthropist, Heo was a successful businessman himself. Well, Heo is still a businessman, leading one of nation's leading business groups "My Business Group" as its chairman. My Business Group includes My Construction Co., My Pharm Ltd., and My Design Co.
Before he was social worker and businessman he was an athlete: Wrestler of Greco-roman style. During his university years and immediate years after graduation he represented South Korea in various sports events as a leading wrestler of Greco-roman style. Based on his strong health as a former wrestler Heo is involved in a variety of social works and other social activities these days. 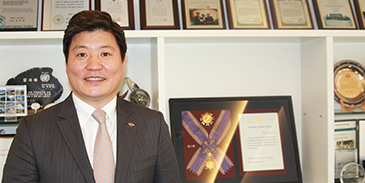 The Seoul Times recently met with Chairman Heo Joon-Young in his office in Hannam-dog area of Seoul. Chairman Heo Joon-Young (2nd from right) of "Sportsdoctors" poses with Angolan Ambassador to S. Korea Albino Malungo (to his left) and with other VIPs in a Seoul gathering. For the remainder of this year alone Heo plans to visit more than 20 countries including Swaziland, the Philippines, Cambodia, China, Fiji, and Kazakhstan. "Within this year I will increase the number of our programs to over 200 from the current 100 per month," Heo stressed. "I will devote myself to help others"
For his dedication to helping the needy and poor folks home and abroad Heo has been decorated with various awards and citations from social groups, local Koran government and international organizations. Sportsdoctors founded by its Chairman Heo in 2003 was registered in the United Nations as medical service NGO. The South Korea's largest medical service social NOG boasts of well over 200,000 medical doctors as its members. With the support of KOICA (Korea International Cooperation Agency), various hospitals and business corporations, Sportsdoctors has been launching various active social and medical service programs in overseas countries including Nepal, Cambodia, Laos, and Swaziland as well as in the nation.